I thought I would use this post as a way to introduce the theory and practice of Ayurvedic skincare to my readers. Keep in mind that this post is just an introduction since subject and practice of Ayurvedic skincare is complicated and involved. I hope that this post can give everyone a “taste” of what it means to practice Ayurvedic skincare. More than a mere system of treating illness, Ayurveda is a science of life (Ayur = life,Veda = science or knowledge). It offers a body of wisdom designed to help people stay vital while realizing their full human potential. Providing guidelines on ideal daily and seasonal routines, diet, behavior and the proper use of our senses, Ayurveda reminds us that health is the balanced and dynamic integration between our environment, body, mind, and spirit. If vata is predominant the skin of a person is dry, rough, cold, wrinkled and thin with fine pores. Vata skin may age faster, and tends to be dry, rough and flaky when out of balance. Vata skin is typically dry and delicate, and tends to lose tone and plumpness prematurely unless nourished on a regular basis. For Vata skin to stay youthful, skin care products used should be very nurturing and should include some essential oils or herbs in combination, which can nourish the skin and rehydrate it. Some treatment approaches to vata skin care includes having sufficient sleep, eating regular meals that will help balance Vata and nourish the skin and avoiding physical and emotional stress. If pitta is predominant, the skin is fair, sensitive, soft, warm, and of medium thickness, less tolerant to hot food and burns easily. When out of balance, Pitta skin can flare up in rashes, rosacea, acne, or sunspots. Pitta skin is generally sensitive, especially to the sun, and needs protection to stay in balance.The Pitta skin type needs both cooling and nurturing. Tanning treatments and therapies that expose skin to steam for extended periods of time should be avoided. If the constitution is of kapha dosha the skin of a person is oily, cold, heavy, soft, slow, dense, dull, lubricating and thick with a tendency towards large pores and proneness to cystic acne. Toxins are the bane of people with Kapha skin. This is because of its oily nature which attracts impurities. The skin should be cleansed from the inside and the outside, or else the skin breaks out because of toxin build-up. Kapha skin needs to get both internal detoxification and external detoxification on a regular basis. Ayurveda’s holistic approach to health aims at treating the entire individual, not just a symptom or specific ailment. The Ayurvedic approach to health encompasses all aspects of a person’s way of living. From nutrition to mindset and from exercise to sleeping patterns, the Ayurvedic approach takes into account not just the person individually, but also the environment that he lives in. When it comes to skin care, the quality and youthfulness of a person’s skin is viewed as a reflection of one’s health. A person who has acne will therefore not just be treated to get rid of the blemish itself, but rather the blemishes will be looked at as a symptom of a deeper underlying condition. A treatment plan will then be suggested that correlates the person’s constitution, or his dosha. 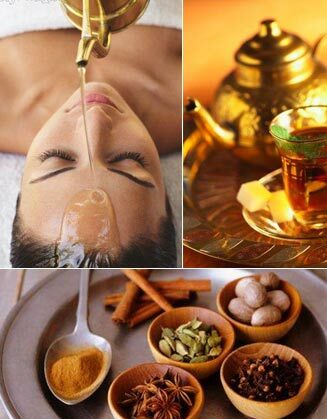 Digestion, elimination, nutrition and metabolism all affect the quality of skin, according to Ayurveda. If any of these processes are out of balance, it will show up through the quality of the skin. An Ayurvedic approach to skin care will therefore intend to restore balance to any or all of the systems that are interrupting the body’s natural desire to healthy skin. The quality of the skin is determined by a person’s dosha, or constitution. The three doshas are vata, pitta and kapha. While each person has all three within herself, usually one or two are more dominant, which creates certain imbalances. Therefore in order to restore health to the skin, the doshas must first be balanced. The overall concept when it comes to Ayurveda and skin care is to choose a skin care regimen that matches the kind of skin a person has. According to Ayurveda, if a person has oily skin, it is largely due to an imbalance in the kapha dosha. A treatment of oil-free cleansers and cooling tonics like cucumbers and lemons might be recommended. In addition, heavy and rich foods, and make-up that clogs pores should be avoided and instead should be replaced by light foods and light make-up. Exercise to release toxins through the pores and to get rid of excess oil is also recommended. If a person has dry skin, a strongly vata condition, the treatment plan looks quite different. Oil-based cleansers and moisturizers are instead encouraged and a diet with a modest amount of healthy fats like olive oil, sesame oil and ghee are also recommended. When it comes to Ayurvedic skin care, natural is best. Ayurvedic skin care products as well as Ayurvedic skin care practices rely only on natural ingredients, chemical-free processing methods and holistic regimens. Some of most commonly-used Ayurvedic skin care ingredients are sandalwood, sesame seed oil, macadamia nut oil, lime oil, lemon oil, clary sage, sunflower seed oil, Gotu Kola, other essential oils, herbs and botanicals. I know this post just provided the briefest of introductions to Ayurvedic skincare. Below I’ve listed more sources for learning about Ayurveda. If you’ve ever treated your skin according to Ayurvedic principles please share your experiences below. Translating Ayurvedic Traditions Into Modern Beauty Products Key to India Market – Skin Inc.
India’s Ancient Beauty – Skin Inc.